I don't know about you but with less than 21 days to Miami Carnival, I have been working out; P90x (following my own routine), Zumba and Mari Winsor Pilates. So it's on. So this recent article, "Fall Fitness: "How Can I Start a Running Routine This Fall? ", fitness expert and personal trainer, Kelly Singer says, "The fall is my favorite time to run outdoors. The crisp air and red and orange colors keep me entertained--it’s like touring a new city. 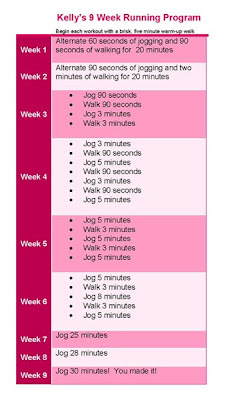 It’s also the start of new habits and schedules so I think it’s the perfect time to start the running routine you’ve been thinking about all summer! Here’s a step-by-step guide to get you ready for a Turkey Trot 5k race near you this November. *Create a special running playlist. Studies show you work 30 percent harder to music you like. *Share your success! I really like FriendFit --it uploads your accomplishments to Facebook and lets friends encourage you. *Get new shoes. Spend your fitness budget here and get them fitted by an expert.